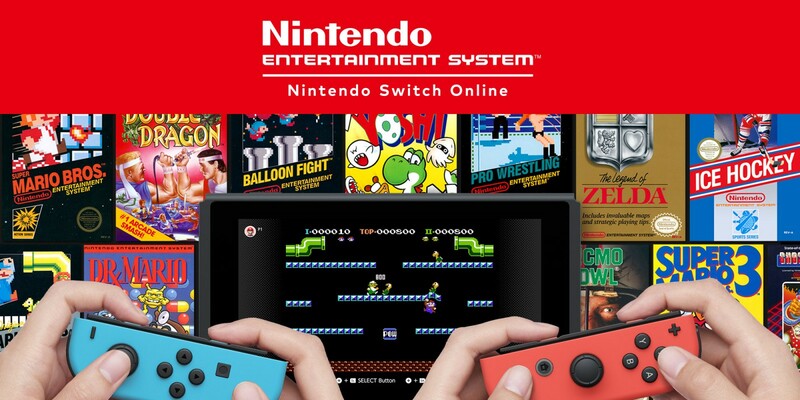 If you have bitten the bullet and decided to pay for the Nintendo Switch Online service, you are entitled to download the Nintendo Entertainment System – Nintendo Switch Online for free. It comes packed with 20 classic NES titles to start and every month will see three more titles added to the collection. The base collection includes Super Mario Bros, The Legend of Zelda and Balloon Fight to name a few. Most of the games are single player but quite a number of them can be played with a friend as well. For the first time ever, you can also play the games online with a friend. Depending on the game, you can play simultaneously or in turns. The right Joystick can be used to bring up a hand marker to help guide your friend when playing simultaneously. If playing in turns, then the player who is waiting their turn can use the left Joystick to guide a hand around instead. The original Nintendo Entertainment System (or Famicom in Japan,) is where Nintendo really cemented their feet into the Video game market. They had success with Arcade machines but the move to home consoles saved the company and brought the fun of video games into people’s homes. The NES / Famicom paved the way for other companies to follow and helped evolve the video game market into what we know today. Over the years, later generation consoles like the Wii, Wii U and 3DS introduced the Virtual Console. The Virtual Console allowed gamers to experience older generation games that originally released on N64, SNES and the NES. The Nintendo Switch has many games but has yet to have the Virtual Console. However, now that this new Netflix-eque service is in place. NES games are playable once again and this time for “Free”. Okay, so they are not technically free if you have to pay a subscription service in order to play them. So, what can I tell you that you probably don’t already know about 30+ year old games? Every game is emulated to run smoothly on the Nintendo Switch, though there are instances where it has glitched on me. Some instances in the game will flicker for no real reason but if I remember correctly, the same instances had the same effect in the original games as well. There are three different graphic resolution options that you can choose; 4:3, Pixel Perfect and CRT. All three resolutions come with black to grey spotted bars down the side and there are no choice of frames to effectively “hide” them. Namco Museum did a much better job adding by at least providing each contained game with its own unique frame. The controls are pretty responsive, although the left joystick can be awkward for movement. I felt myself using the Directional buttons more than the joystick as they are better suited for these games. Although, I will admit a proper D-pad would feel much more comfortable. The only controls you will only need to use are the Joystick/ directional buttons, A and B button. The + and – buttons are used as Pause and Select respectively but you won’t use them much accept to commence a game or choose game mode. The main screen displays all the games currently available to play. You can customize the screen however you like by changing the order of how you would like the games to be displayed. You can place up to 9 games on a single row but there doesn’t seem to be a limit on how many rows you can have. This is good news as Nintendo has made sure that there is plenty of room for more games to be added later. There is a little of something for everyone. Adventure games, platformers, fighting, sports and puzzle make up the majority of genres available. If you like Sports, There are plenty to choose from. There is TECMO Bowl, Soccer, Baseball, Excitebike, Ice Hockey, Pro Wrestling and Tennis. If fighting games are more to your liking then Double Dragon and River City Ransom should help scratch the itch. Arcade favourites like Donkey Kong, Mario Bros and Gradius are also among the selection of games. During a game, you can save your progress in any of the four slots at hand. Each game has it’s own save slots so you don’t have to worry about deleting other game’s save data. You can save and load anytime you like via the software’s sub menu by pressing ZL and ZR simultaneously. One feature that is missing is an autosave. Saving has to be done manually because if you don’t save before exiting a game to play another, you will lose your progress. 20 games to play is a great start and though some of them pale in comparison to video games of today, they were iconic titles in their time. Super Mario Bros and The Legend Of Zelda are still great yet challenging games to play. If you do eventually get bored of the games or have completed them all for the umpteenth time, don’t worry. Nintendo will be releasing more classic NES games every month to help get the most out of Nintendo Entertainment System – Nintendo Switch Online. Well, if you have to pay for a service, you may as well get as many free games out of it while you can, am I right? When playing online, there a few things that you will need to know. First off, make sure you have a good internet connection. For games that are only the size of kilobits, they sure do lag at times. button inputs can be slow to register as well. Nintendo has added a secret remedy for that in that you can activate Low-Latency Mode but it can affect sound and visuals. As with most games being played online, one player creates a room and the other can join it. The one who created the room has control over what game the two players play. It’s a nice touch but playing online does depend on voice chat and that is where Nintendo’ own voice chat app comes in. The Nintendo Switch Online app comes with its own voice chat app that supports certain games. The voice chat app works in regards that you can talk to your friend on another part of the world whilst playing together in Nintendo Entertainment System – Nintendo Switch Online. It is still not the best and the fact that you have to use an extra device like your smartphone is a rather backwards step that has still not been remedied. To be fair, you could get a better experience with Discord or even just calling your friend if you have to resort to using your smart device. Even though, everyone is still pining for Virtual Console and Gamecube games to come to the Nintendo Switch. I do appreciate being able to play the classic NES games on the Nintendo Switch. There is a possibility that this is just the first step in a new direction. The SNES – Nintendo Switch Online could come next, along with the N64 – Nintendo Switch Online. If this is the successor to the Virtual Console, I would rather have it than nothing at all. The bonus of being able to play these games with a friend online is a nice touch. However, the lag issue will have to be looked into. It’s a shame that these “free” to play games are hidden behind a paywall. I would have preferred a collection of NES titles in the way of Namco Museum but at the end of the day if you need the Nintendo Switch Online service to play online, you may as well make the most of it and download Nintendo Entertainment System – Nintendo Switch Online as well.